Republican Bob Kolenberg, 27th District Senatorial candidate, debated against challenger Carlo Leone (D -148) Tuesday during the Darien League of Women Voters' debate. DARIEN -- Darien residents voting in the Feb. 22 special election for the 27th Senate District have many issues on their minds, ranging from transportation, public education, the death penalty and teacher tenure. About 100 people attended an hour-long debate at Darien Town Hall Tuesday night between the two candidates, State Rep. Carlo Leone, D-148, and Republican challenger and Stamford Board of Finance member Bob Kolenberg. 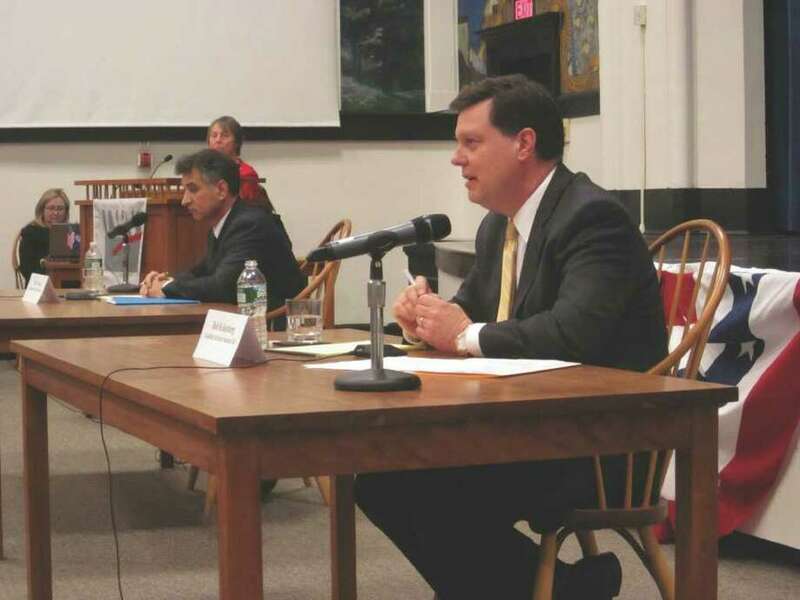 The debate, sponsored by the Darien League of Women Voters, was an opportunity for voters to ask questions of the candidates running in a special election later this month to replace state Sen. Andrew McDonald. McDonald's seat was left vacant when he was appointed to Gov. Dannel Malloy's cabinet. "Whatever the state has been doing is not working," Kolenberg said off the bat to an audience-generated question about a state legislator's role in keeping jobs in the state. "I know how to create jobs. I've created jobs all over the world." Kolenberg, a private equity investor who once owned an off-lease car dealership, painted a picture of himself as someone who will work to keep government spending down and cut jobs at the state level to balance the budget. Leone, who works for a non-profit in Bridgeport and immigrated from Italy with his parents at 2 years old, went to bat for the little guys, saying government should be careful about cutting state jobs too deeply. "I've never forgotten my roots," he said. "I've always worked hard to get where I'm going." Debate organizers timed the candidates using a cumulative time system, which required candidates to monitor their own speaking time, but gave them each more freedom to answer questions with less time restraint. The eight questions of the evening were generated by the audience, and organizers went around the auditorium collecting handwritten questions on index cards. On the topic of balancing the state budget, Kolenberg said he would not support raising taxes to bring in more revenue, adding that Connecticut residents already pay one of the highest tax bills in the country. He said the private sector has seen many job cuts, and he says it's time to do the same on the state level, privatizing such departments as the Department of Motor Vehicles. "There is room to cut jobs and the workforce," he said. "Realistically, at the state level we have to cut jobs." Leone disagreed, saying that cutting too many jobs would lead to cutting important services in the state. He said he thinks a balanced budget would require more borrowing and increased fees. "I would not cut so deep that you eliminate our safety net," he said. "I wouldn't take away any options we have to balance the budget." Both candidates agreed that the state Department of Transportation has to do a better of job of improving public mass transit in the state, but stopped short of offering viable solutions. Leone pointed to his experience in the General Assembly, adding that he helped pass legislation that led to a $35 million investment in the Stamford train station. Kolenberg said he has experience working with the governor, a former Stamford mayor, and joked that the DOT should move their office to Greenwich. "We should let them commute to Greenwich every day from Hartford," he said. "I guarantee you'd see some interesting ideas on how to correct the problem." Both candidates said that they would be willing to work hard to improve the state's affordable housing law, which mandates that ten percent of a municipality's housing is affordable -- something that small towns like Darien find difficult to maintain. Both said they'd push for the state to explore opportunities for renewable energy sources, but agreed that solar, wind and geothermal energy is not yet cost-effective without government subsidies. On public education, both candidates said they would work hard to bring more money to Darien, and to help make sure that "unpaid mandates" such as special education are fair to the town. "I've always worked hard to make sure the students of Stamford got a good education," Kolenberg said, adding that his father was a teacher. "I like to see the money stay in the classroom with the teachers." Leone said he would work to support the building of new schools in the area, and specifically said trade schools, such as Wright Tech, which was closed last year under Gov. M. Jodi Rell, would be rebuilt and supported. "You still need carpenters, plumbers and electricians," he said. "I don't think we should undercut ourselves by doing the wrong things." Audience members also asked about what the candidates thought about the death penalty in Connecticut, as well as their stances on teacher tenure. Both agreed that teacher tenure is good for retaining good, effective teachers in the state, but that they want to make sure it isn't abused and that there is a way to keep teachers accountable. "I think the idea of tenure has gone too far," said Kolenberg, who added he is a proponent of free enterprise. "Anytime someone is locked into 100 percent job security there is no incentive to do a good job." On the topic of the death penalty, Kolenberg said he "believes in an eye for an eye," but said he thinks safeguards need to be in place "to insure that there is no chance an innocent person can be put to death." Leone added that in cases where there is no reasonable doubt, he would support the death penalty. "I will continue to do so," he said. "For those who would disagree with me, I would respectfully disagree with them."